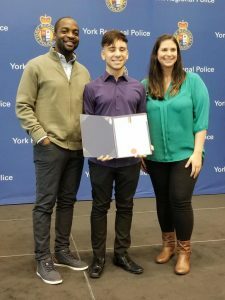 On December 13, 2018, Ethan DeFina, our very own Carter grade 11 student, received the prestigious St. John’s Ambulance Award at York Regional Police Headquarters. 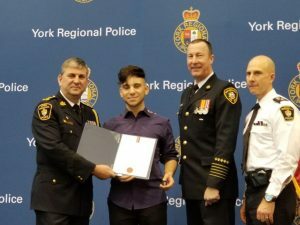 He received the award for performing CPR on his father when he was only 14 years old. This is how the day unfolded. It was a day like any other day for the De Fina household. The boys were enjoying dinner while dad was taking a phone call in the other room. However, it soon took a turn. Ethan suddenly noticed he couldn’t hear his dad’s voice. Ethan found his father face down. Immediately, Ethan turned his father onto his back and ensured his tongue didn’t block his airway. 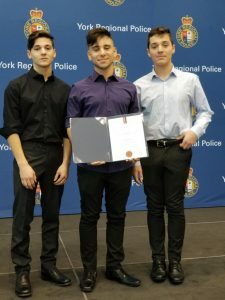 Ethan began to perform CPR until paramedics arrived. Several minutes later emergency responders resuscitated Mr. De Fina and transported him to the hospital. Responding officers, paramedic services and fire all remarked on Ethan’s calm demeanor and credit his quick thinking providing the necessary life saving actions that allowed for his dad to be with us today.